measure 7%x6'Ai in. 24 envelopes included. Shipping wt. box 1 lb. 4 oz. 3 N 5661XV- With name.
" How to order," page 258. Includes 21 cards, 5 designs. foil. 21 envelopes. Shpg. wt. 15 oz. Shipping wt. box 1 lb. 1 oz. envelopes. Shpg. wt. box 12 oz. Shipping weight box 1 lb. 3 oz. stock. 4x6% in. 24 envelopes. Shipping weight box 1 pound. 2 thru 7 ) for imprinted cards, see " How to order". page258. No home should be without th is fresh . scriptive subheadings for major divisions within each book. With Apocryl>ha: 1,824. pages. Measures 9x6 inches. New Testament. Soft cover. 464 pages. 5'Ax8 inches. tion page, family t ree, baptismal record and more. returnable unless name printed incorrectly. No C.0 .D.'s. 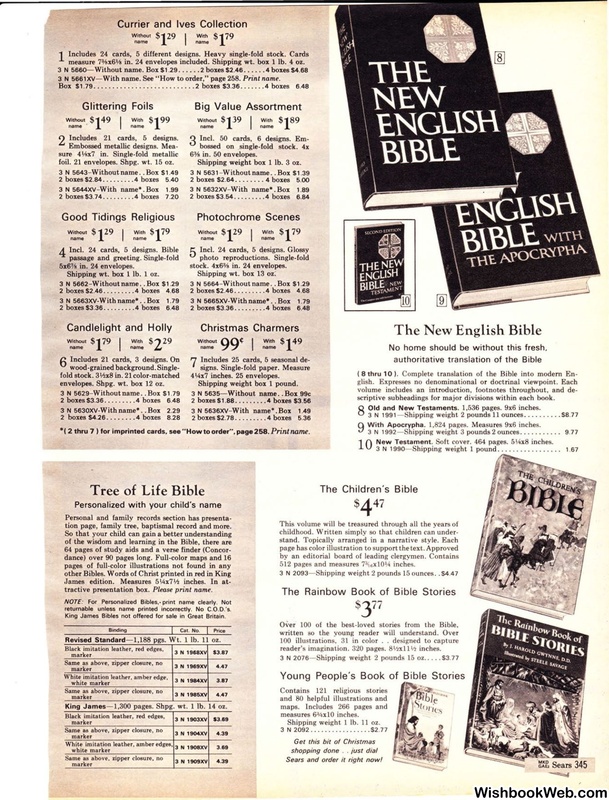 King James Bibles not offered for sale in Great Britain. Revised Standard- 1,188 pgs. Wt. 1 lb. 11 oz. King James- 1,300 pages. Shpg. wt. 1 lb. 14 oz. reader's imagination. 320 pages. 8';1xll lf1 inches. Shipping weight 1 lb. 11 oz. Sears and order it right now!